I have had the luxury and pleasure to visit hundreds of repair facilities across the Midwest. I was always accompanied by a distribution representative that would give me a brief synopsis of the type of shop we were getting ready to enter. It was always interesting to walk into the waiting area and see how inviting it was to the client. We were usually greeted by the shop owner or a service writer that was familiar with the store rep I was with. I always looked for some element of the waiting area to discuss and start the conversation. One thing I always liked to bring up was the number of technicians that were employed in the shop and how business was. Do you have trouble finding techs? Once the conversation started, it would usually move into the shop. Believe me, this is where I have been both surprised and disappointed. I would often ask what the owner was doing to help his technicians stay ahead of the ever-changing technology of today’s vehicle. The answers ranged from they were required to attend 20 hours of training a year to the shop owner bringing in trainers monthly and closing the shop one afternoon a month to participate in this training. Then some owners would say that they encouraged the techs to attend manufacturer training but did not require them to do it. There was a very wide variance in the responses to the training question. One common thread was if the owner participated in training then the techs participated. Another common thread to the training discussion was they hated to attend a training course only to find out it was very little training and a whole lot of selling. This was probably one of the biggest turn-offs for both the technicians and the shop owner. When they attended one of these types of classes, it felt like time wasted. They were there to improve their abilities in order more to make money. Because let’s face it, there is a certain amount of bragging that goes along with the knowledge of how to diagnose and repair a vehicle. We all know that when you’re an automotive technician, the bottom line is how will this help me make money repairing the client’s vehicle. I believe all training is measured off this basis especially since time is so very valuable in today’s world. I have often thought about how I could make a training course better that was being presented to a room full of technicians. One thing I think is needed is real-world examples/case studies and actual diagnostic principles that can be recreated time and time again. Hands-on examples or, even better, a real vehicle that can be used to simulate the actual problem. I think we, as technicians, learn by doing, not just reading it on the page or in a PowerPoint. I used to work at a Ford dealership, and they would send me to the local Ford factory training facility in St Louis. I would spend at least two weeks every year learning from some amazing trainers. There was one individual I always wanted as an instructor: Jon Neil. 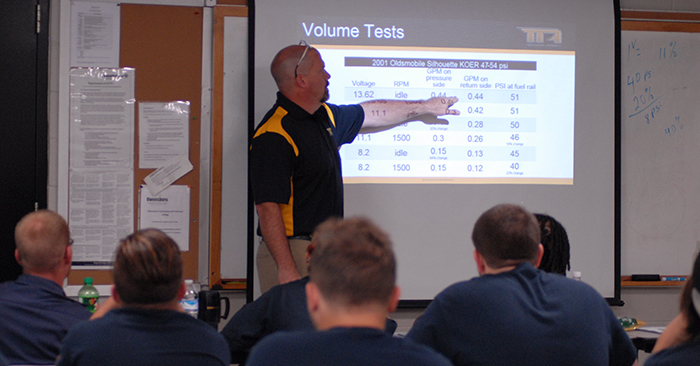 Mr. Neil was able to present diagnostic methods that technicians could understand, take back to the dealership, and share with the other techs. But as time got a little leaner around the dealership, they opted to participate in computer-based training which amounted to a bunch of CDs with a not-so-exciting presentation. I’ve always believed that it’s hard to replace an actual live in-person instructor with computer-aided training. But, I have seen some cloud-based training that was very intensive and engaging. Do I think it could possibly replace the instructor-led classroom training? I believe it could for some categories and at a specific level of training most assuredly it could. I am especially excited to see where AR/VR can take future training to. We can now see a few higher-level OE manufacturers using this technology to train the technician in the bay throughout their vast dealer networks. One big advantage is there is no travel time for an instructor or the technician. We all know how this can be a huge advantage. I am afraid that it will be quite some time in the future before this training will be available to the independent repair facilities, but I hope someone develops a reasonably priced version that the independents can justify offering to their technicians. With all the advancements, I believe that there will never be a complete replacement for training events such as VISION Hi-Tech in Kansas City or Automechanika. These events bring together some of the greatest trainers in the United States to a group of technicians that are excited about the knowledge. So, whatever time or level of training you are comfortable with, just do it. I encourage your input and any comments you might have [email protected].